There are a number of items that a shepherd just could not do without. They are very much like your right hand. The stick being one of them. Often referred to as the shepherd's crook but around these parts known quite simply as the stick, or mebbes lambing stick. In the days before quads, herding (shepherding) was done either on foot or pony. The stick was invaluable for getting a decent footing when covering rough ground, it helps balance you, gives you something to lean on when climbing uphill and something to steady yourself when coming down hill. I find it awkward and uncomfortable to walk on hill ground without a stick, it is such a help and you soon find you're accustomed to using one. Even when on the pony the stick would be carried as it is actually used for catching sheep, stuck in the ground it is ideal to tether the pony to should that be necessary. The above is my old faithful, made from a hazel shank and a ewes horn, it is invaluable at lambing time for catching both ewes and lambs, the curved ewes horn head has enough width to enable it to wrap around a ewes neck for you to be able to catch a hold of her out in the open. My stick is as light as a feather, comfortable in the hand and cut to a length that suits me, which is just above waist height. I have had the stick for so many years I can't rightly remember and only last year a shepherd who does stick dressing told me it looked worn and shabby and offered to sort it up, my reply was "don't mend something that isn't broken"
There are many types of stick available but I prefer the old fashioned, hand made job. Metal sticks are cold and often heavy, the ones made all of wood will straighten when they get wet, there are now fibre glass sticks which if I had to revert to using a manufactured stick this is what I would opt to use. Above are the three things a shepherd ought always to carry in their pocket. Pocket knife, string (baler twine) and whistle, three things I couldn't do without. All are invaluable to every day life. The knife: cuts strings on bales of hay. Will cut through wool as occasionally sheep can be tangled by their wool in either branches of trees or wire, hand shears aren't on hand but the good ol' knife will cut through the wool and release the beast. Paring feet, if foot shears aren't on hand the knife doubles up nicely for paring the loose or long hoof off the foot, also doubles up on my finger nails occasionally. Skinning lambs at lambing time - to use the skin off a dead lamb and place it on a live lamb enabling an adoption to take place. There will be many more uses, I take it so much for granted that I have a pocket knife and can use it for what ever is required that I don't really know what all these requisites are! String: Baler twine from a small bale of hay or straw. Always have some in your pocket. Can tie a gate if the chain has broken. Repair a fence in a hurry. Tie a sheep up to prevent it from running away. A dead lamb can be towed along with a long length of string and the kindly ewe will follow until you can get her to a pen out on the hill. Useful dog leads or dog tethers. Will hold your trousers up. Again invaluable and a must have. Whistle: Dog whistle with string attached to be worn around the neck, this keeps it safe, you can't swallow it and also when you spit it out of your mouth it doesn't fall to the ground and get lost. I holler (shout) at the dogs quite a bit and whistle with my lips even more but the strength of the whistle from this little gadget is amazing and the dogs can pick the sound up from a great distance, it saves you from being hoarse from shouting and the strength of my own whistling is not good enough to travel long distances ( I never learnt to whistle with my fingers). My dogs work best to the whistle and a quiet voice, all the hollering really does is give me a chance to vent my frustrations and occasionally back up the whistle when the dogs think they know best. All of these are invaluable to a shepherd. There are two others which can't be bought, given or acquired, two which most are born with. Two senses - sight and sound. Your eyes and ears are a priceless commodity, the power of observation is absolutely vital to the job. Last but not least - the most important tool of the trade for the shepherd - a dog. Or in my case two dogs. Glen and Moss. Hill shepherds can have many dogs, young dogs coming on and learning the ropes, older steadier dogs that know the job. If there is a lot of ground on the farm to cover, or if it is hard ground, there will be more dogs on the farm as it is unfair to work them into the ground, it is necessary to have a change of dogs on big days and busy times of the year. My dogs are the most important tool I have. Without them my job would not be possible. 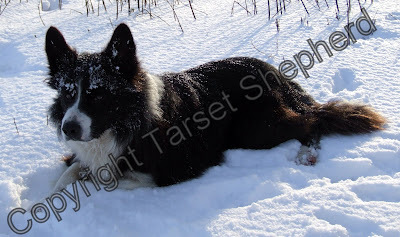 They don't always get much mention on this blog but believe you me I would be well and truly lost without a useful sheep dog and quite a lot of the work I do as a contract shepherd is due to the fact that I have two working dogs, wide running hill dogs which are dependable (majority of the time) and basically help me to earn my living. Even the better half has come to accept that he plays second fiddle to the dogs, they are top of the list and are as dependable of me as I am of them. Glen is the older dog, he's had a rough winter, being off form, but appears to have 'cheered' up at long last. Moss is the younger of the two and in many ways now 'top' dog (he'd definitely like to think he is!). Two totally different entities, both with their strengths and weaknesses, neither of them perfect but perfect enough for me and those I work for. Not so much a tool, more a part of me, might right and left arms. Someday I'll introduce you to them. What an informative (and fun to read) entry! I was looking through the web for details on tools of shepherding, and came across this. Thanks for posting it in such a readable format and I look forward to "meeting" Glen and Moss! Thank you for your kind words and pleased to hear you liked the posting. Hope you found it helpful! Glen and Moss can be found on other posts too, although Moss has been overlooked somewhat, there is also a new addition now - Kale - although he is very young and yet to prove his worth.